The Brussels Cook(er): "Who ate all the pies?" Put the seasoned flour and chicken pieces into a ziplock bag and stir to combine. Heat half the oil and butter in a large pan and cook the leeks and garlic over medium heat until soft (ca 5 mins). Remove the leeks, add the rest of the butter and oil and fry off the chicken pieces until lightly browned and sealed. Add the stock and scrape off any pan stickings. Add the leeks, wine, cream, peas and tarragon and simmer for 5 mins. While the mixture cools, line 4 loose-bottomed tartlet tins (10-12 cm) with baking paper. Roll out the puff pastry and cut 4 circles big enough to line the bases and sides of the tins. Also cut 4 circles for the tops. Line the tins with the 4 big circles and spoon in the filling. Place the tops on the pies and crimp/seal the edges firmly with your fingers. Bake in the oven for 35 mins or until golden brown. *If you use already cooked meat, just add the 3 tbsp of flour to the filling after the tarragon and stir to combine before simmering. **I always save any leftover bits and pieces of leeks from previous meals in the freezer - and I often top this up with ready-chopped frozen leeks - Aldi (Trader Joe's in the US) sell 700g bags for 89 cents which is fantastic value. Use ca 350g for this recipe. ***I also use frozen tarragon as I haven't had any luck with growing them in my garden and a bought pot just goes to waste... A small container from Delhaize costs just 1.29€ and lasts for AGES. What a great combination for a pie! :) Your individual ones turned out LOADS better than mine! Lol I'm so bad at shaping dough, it's hilarious! 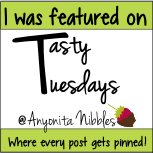 Thank you so much for linking up with me this week at Tasty Tuesdays! I’ve pinned this & shared it with my followers! Please be sure to stop back by the party and check out some of the other links! Oh...these little chicken pies look great! So pretty and the combination of ingredients look great!